The mail queue displays all currently queued mails in regards to wishlist functions. The queue can also be used to generate price drop notification mails. This tab can also be used as a sort of fail safe as it enables you to delete mails before they get sent out. Keep in mind that this queue will sent a selected amount of emails each hour. You can however use the button „Send Mails“ to force the sending of mails. Here we see a queue containing three mails. Two of them are product promotions and one is a price drop notification. We now have the option to delete an email or force to send them out by clicking on „Send Mails“. In the top left we also get some details about our current queue like how many items are in the queue and how many mails will be sent out by the hour. Once you change the price of a product a cronjob will pick up on that change once per hour and generate price notification mails to be sent out. If you don’t want to wait for the cronjob to run you can also take control yourself. 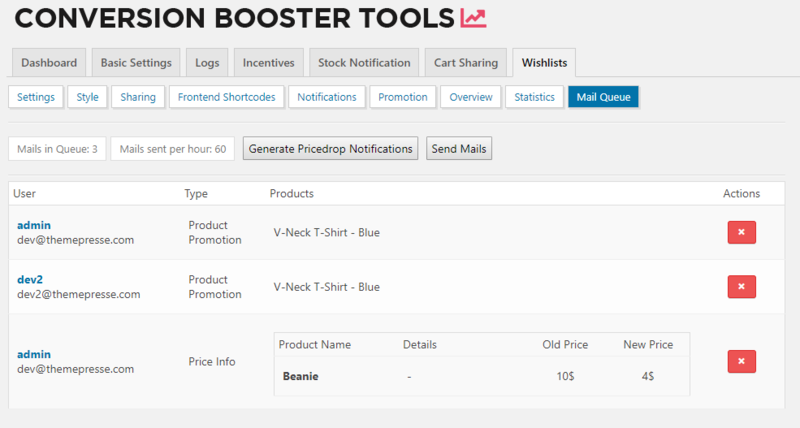 Right after you change the price of products in your shop you can head over to the „Mail Queue“ tab and click on the „Generate Pricedrop Notifications“ buttons. This will start the script to look for updated prices and will then generate mails and save them to the queue.